GREEN BOOK is, without a doubt, everything you expect from an Oscar movie. It focuses on the relationship between musician Dr Don Shirley (Mahershala Ali) and his driver/bodyguard Tony Lip (Viggo Mortensen), whose racist tendencies are challenged as they tour the deep south. Don, in turn, gets the opportunity to overcome his own prejudices against the working class, as he develops an appreciation for Tony’s intelligence, professionalism and humility. But like a lot of Oscar bait movies, it has a catch. GREEN BOOK’S story heads in a direction you do not anticipate. The message it’s trying to portray is that friendship can overcome prejudice. But in actuality, the story demonstrates that prejudice can be overlooked because of friendship. At the end of the movie, Tony Lip is forgiven for all of his past actions, he hasn’t learnt anything, and he has hardly developed into a better person. Although this shows the characters under authentic shades of grey, writer/director Farrelly uses the conflict to introduce an uncomfortable type of comedy. Tony’s racism is played for laughs – but not at Tony’s expense. We are encouraged to laugh along with him, which is problematic. Elsewhere, however, there are brilliant laugh-out-loud moments. The chemistry between Mahershala Ali and Viggo Mortensen is electric, and their special friendship evidently extends off-screen. GREEN BOOK has been nominated for five awards at the Oscars, including best picture and best actor, and they are well deserved. However, it will probably be a close contender with VICE and THE FAVOURITE, and doesn’t necessarily have the qualities to be a guaranteed winner. Viggo Mortensen has more of a fighting chance of winning against Bradley Cooper for A STAR IS BORN, and Rami Malek for BOHEMIAN RHAPSODY; although Malek may be an underdog. It’s more likely to be won by Willem Dafoe for AT ETERNITY’S GATE, as he’s one of the classic method actors the Academy loves. 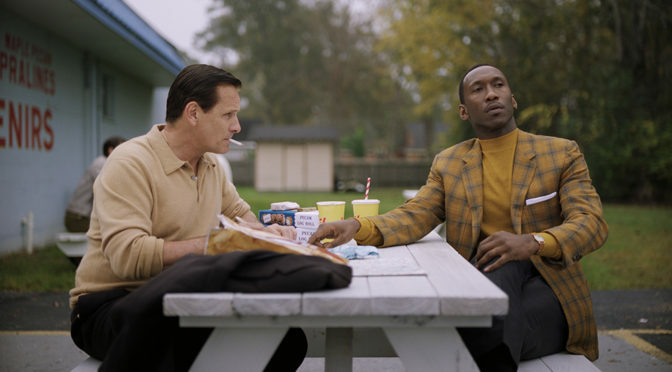 Even if GREEN BOOK doesn’t win any awards, it still holds up as a brilliant but flawed film. The character development and writing leave you wanting; but nevertheless, it’s a heart-warming story.